Knowledge economy needs a better digital representation of knowledge, needs a knowledge engine. The true coming of knowledge economy needs a core technology breakthrough, which is to give knowledge a better digital representation on the internet, which includes a knowledge engine to transform experiences into knowledge more effectively. With this technology breakthrough, it is possible to have vast knowledge based cooperation happening on the internet. The so called knowledge economy based on the internet needs a better way to represent knowledge digitally. The current formats for representing knowledge digitally are very insufficient for knowledge cooperation. For example, yes, blog is a way to represent knowledge. You can summarize your experiences, and you can share these experiences with other people. And later you can review your blogs as a way to review your past experiences and knowledge. But this way of representing knowledge is very ineffective. Knowledge is in big blocks. One blog post may have several good knowledge points, and another blog post may overlap with similar knowledge points. And you might repeat these points over and over again in many articles. It is also very hard for other people to cooperate with you on these knowledge points (Although commenting can get some views from other people). Wiki is also a format to represent knowledge, and it is more tuned towards knowledge cooperation. But it is still quite ineffective. The google group or various discussion forums are good at getting inputs from various people. But to extract knowledge from the discussions take a lot of efforts. For open organizations, they are usually exploring new frontiers of various social domain, for example education. In the journey of exploration, the organizations need effective ways to document their knowledge and share that knowledge effectively with similar organizations around the world. But currently there is no effective way for these open organizations to construct their knowledge while exploring, share that knowledge with others and cooperate on those experiences and knowledge. Blog, wiki, google groups and so on, are insufficient. So we need to know what is knowledge deeply in order to give it a good digital form on the internet. So what is knowledge? Here allow me to be brief. Knowledge is a dynamic streaming structure. Its source is individual daily experiences. The brain is reconstructing these experiences over and over again to form a better structure, which will help you to quickly recognize problems or solve problems when faced with new situations. The reconstructing of experience to form knowledge happens mostly in two ways: one is to filter out unimportant ones and adding more weight to important ones as time goes by and as you gain more experiences; the other is to categorize knowledge and change your categorization system from time to time, often in a way of finding a better bottom level knowledge that unites knowledge above. So the unit of knowledge is daily significant experience. Here we have the concept of Significant Experience, which you can read in this essay, in which the word “significance” have the same meaning as how it is used in scientific research. When you say the experimentation results shows “significant” difference, that means the difference should not be ignored. The basis of thinking is telling difference. The basic unit of knowledge thus should be significant experiences. Significant Experiences are the building blocks of knowledge structure. The structure includes two aspects: one is the classification on different levels; the other is the weight of importance of each significant experience. Learning is the process of forming structured knowledge as mentioned above. This includes finding the focus domains in the current period of time according to individual interests (Everyone is interested in several fields during a period of time) (Surely you should also consider your ability and your current environment. First you shouldn’t pick too many domains that go beyond your capacity. Secondly you should best take advantage of the resources of your current environment. I won’t go into more details here.). Then arrange your activities to accumulate your experiences in these domains. Reflect on your experiences regularly and do some critical thinking (such as collecting all experiences, classifying experiences, filtering out unimportant ones and adding weight to important ones, finding new knowledge at the bottom which unites other knowledge, form the understanding of the whole, and etc.) Verify your knowledge with new situations to see if you can identify and solve the new problems quickly. Iterate this process to reach a good structure of the whole knowledge. Then find new interested domains, expand your knowledge, and keep finding bottom knowledge that unites everything, finding more general understanding. Improve yourself continuously this way, so you can face more complex tasks. Of course, although these processes are happening inside everyone’s brain, not everyone is aware of these processes. In internet ushered knowledge economy, we need software to help us better accomplish the process above and to achieve knowledge cooperation. Knowledge engine is to transform experience into knowledge. And knowledge economy based on internet needs this knowledge engine. It is like the engine in the industrial era. You need that to make ships, cars, and airplanes, mowers, razors, and so on. In the knowledge economy, we need knowledge engine to build the ship, cars, and airplanes in the knowledge age. So by using the knowledge engine to record your daily experiences, and accomplish some simple editing tasks regularly, you can accomplish learning and many thinking processes. We demonstrate a better digital form of knowledge, which is a dynamic streaming structure. Not only do you have the versioned (or we can call milestones of knowledge) static writing that represents an understanding of the knowledge at the time, you can also view those significant experiences that are driving and shaping the knowledge along the way. We also demonstrate how significant experiences can be easily recorded and accumulated, how individuals work on those significant experiences by simple editing operations, how others provide inputs and guidelines through commenting and voting mechanisms. Overall, we show you how scattered activities every day over a long period of time can be turned into a dynamic streaming structure – knowledge. We also show you how these dynamic streaming structures can be shared and applied to various situations. The structured knowledge formed can even be applied to knowledge engine itself, so knowledge engine is a self-reference system. For example, you can set in your setting which knowledge (tag tree is used here) can be used as your root knowledge (e.g. system root tag tree), and that root knowledge will be applied when you create a new learning area (the system root tag tree is inserted into the automatically generated area root tag tree, and a frame about how this root knowledge is applied to this learning area is also auto generated and inserted into the auto generated root frame of that learning area. If you already have a frame with the same name, that frame will be used instead of generating a new one). Thinking is to tell difference. First consciousness tells the difference. This is experience. Then it is the brain that does various logical analysis on these differences detected. So the base of thinking is experiences. To think effectively, you need to know what specific experiences you have had. In our thinking, a lot of energy is used in recalling past experiences. Memory recall is a very exhausting process, especially when you are doing it subconsciously. So to do effective thinking, you can first focus on just collecting your past experiences. (You can do so by reading past notes, or stuff you have read or watched in the past, or objects that can help you.) After you have had all those experiences shown vividly before you, you can start working on them with your brain. And once you had all your experiences before your eyes, the thinking should be very fast (lightening fast). But if you already put down your experience digitally when it happened, you only need the system to find those experiences in a certain period of time or in a certain domain when doing thinking. This saved the exhausting process of memory recall. With all experiences shown before you, it is like visualized experiences/thoughts. Then you just look at those experiences and do your thinking. How to use knowledge engine for learning? First you record your important daily experiences and thoughts. The key is not to spend too much time recording your experiences. It is better to be short and brief, as long as it is enough for you to recall that experience when you review it later on. Then you organize these experiences regularly to achieve the effect of learning. For example, reviewing them weekly, monthly or yearly to form a good learning habit. When you are editing your records, all learning methods and thinking ways can be applied. For example, you can use the system to find experiences in a certain period of time or in a domain, then you just review these experiences quickly without much thinking. You are solely recalling the past experiences. Then you can give a weight of importance to each recorded experience/thought. We know some experiences are just random thoughts. You probably felt important at the time, but the experience/thought never came to you again. So it probably just is a random thought. So you don’t need to pay much attention to random thoughts. But some experiences come to you over and over again. Then they are the important experiences. So by giving different weights to each record of experience, you accomplished one important task of learning: to filter out unimportant experiences and to keep the most important ones. You can also categorize your experiences (by tagging, for example). It is said earlier that learning is to intentionally accumulate experiences in various domains. You can accumulate your experiences by various activities. And the experiences you gain in an activity might be related to several domains. So by categorization, you are categorizing knowledge. This is another important task of learning. With some experiences, you might not know how to categorize them. You can leave them there for now. After some time, you might have gained more experiences and you can look back on those old experiences. You might then realize that you are actually opening up a new domain of knowledge. So you create a new tag for them. So you accomplished the process of knowledge discovery. You may also realize that there is a better way to categorize your experiences. So you replace old set of tags with a new set. That means your brain is having a better understanding of knowledge and is forming a better structure (which usually is a more beautiful structure). The is is the natural process of brain’s learning. And through simple editing operation, you accomplish this important learning task. Other than the operations above, there are other ways that knowledge engine can help you learn or think. For example you can focus on records of experiences that are not yet categorized or assigned weight to find something there. Or you can put experiences of a certain set of tags together to do knowledge collision, to see if something new and creative might come out. Knowledge engine lessens the burden of your brain since it takes over the burden of memorization. When you have some important experiences/thoughts, you note them down quickly. And then you can go back to what you are doing, and don’t need burden your brain trying to carry those experiences inside your brain. And after some time, you can use knowledge engine to recollect what you have experienced. When you are thinking, since knowledge engine takes over the burden of memorization, you can do very quick thinking. Since experiences are recorded, you can do various editing operations to accomplish various ways of thinking. It makes learning easy for everyone. Just by following some common ways of editing, students learn how to learn effectively. By doing editing regularly, students form a good habit of learning or the so called discipline. Thus learning is not a mysterious thing anymore. Normal people can grasp the hang of learning and thinking. It makes it easy for organizations to construct their domain knowledge through their exploration. Organizations become learning organizations. Members explore and learn of a domain together, and build the knowledge together. The structured knowledge in the new fields can be shared with people around the world. In the past, it is hard for people to communicate their knowledge with other people, since everyone has a different framework of thoughts, and everyone has quite different experiences, and everyone is constructing his own knowledge map. But knowledge engine will make the communication of knowledge easier. A knowledge library or map shared by all people can also be constructed. With knowledge engine, the production of knowledge is also totally different. Knowledge will come from the broad base of crowd, forming the true sense of knowledge “ocean” instead of current knowledge “islands”. Sine knowledge engine can represent the knowledge structure inside a human brain, then teachers with true knowledge, those with the whole picture of knowledge, can effectively guide students by providing direct feedback through knowledge engine, achieving the true sense of “teaching”. This way, those professionals with rich experiences in the field can easily teach beginners and guide them in their learning. Thus, we can open up the profession of “teaching”, instead of having people trained for purely teaching and nothing else. Since students can demonstrate their learning through knowledge engine, and they participate in the open source knowledge construction, employers can easily select candidates who have the real experiences and understanding of the domain knowledge. Furthermore, the ability to explore unknown domain can be demonstrated by knowledge engine. Thus employers can find candidates who are more able to think independently, which are what the current economy needs. The freedom of learning demands the freedom to learn what you are interested to learn, from who you want to learn, how to learn and when to learn. Knowledge engine will make the freedom of learning possible. 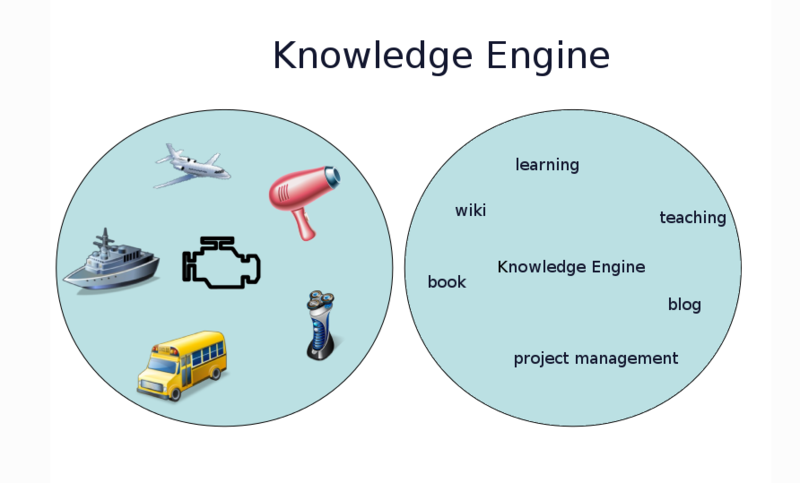 There are more interesting aspects and questions regarding knowledge engine. I won’t go into details here. By giving a better digital representation of knowledge, actually what we are doing is digitalizing human consciousness, e.g. digitalizing human brains. The essence of what software and internet are doing is actually digitalizing human world. And digitalizing human consciousness is the highest form of digitalization. The revolutionary change that internet will cause in education and knowledge cooperation, demands this kind of digitalization at the deepest level. On this level, we can see the digitalization in the past is far from sufficient. Education and knowledge are always the fields that are very hard for people to understand. There are many generally accepted wrong views. For the internet to change education and knowledge cooperation, we have to come to the topic of digitalization at the deepest level, to represent human consciousness as it is on the internet. The human world is about to enter the era of Knowledge Economy. In this Knowledge Economy, we need people who are able to explore knowledge. However, our education system is still the one that was invented to serve the mass production era. The function of this outdated education system aims to strip away human beings’ higher capacities and keep only the lowest ones, so people can work along the assembly line and be part of the assembly line. So in that education system, human beings are just a higher form of machine. But this new Knowledge Economy needs people who are able to explore knowledge and think independently. Thus we have the great crisis in US. On one side, many people are laid off from assembly lines and are unable to find jobs. On the other side, the new economy, especially the software and its impacted industries cannot find capable candidates. US is facing a great crisis. The crisis has many facets. The root of that crisis is in nowhere but education. Knowledge engine can help realize the true meaning of learning and teaching, and help usher the era of Knowledge Economy. Wiki is a good way to demonstrate the final achieved understanding of the knowledge (since wiki is versioned, it can also show versions of that knowledge.). But any knowledge comes from people’s significant experiences, and when the wiki page is written up, the understanding is achieved by working with those significant experiences. However, the raw material (those significant experiences) and the dynamic process are lost. Also in the process of creating the wiki page, although many people can cooperate on the writing, the cooperation is ad hoc, and can often be chaotic. That is because they don’t have a finer grain of knowledge, e.g. the significant experiences to work on. With our so called knowledge engine, however, we want people to cooperate on those significant experiences directly, and the cooperation can be more orderly. It would be more interesting to compare knowledge engine to mailing list, of which google group is a very good one. Mailing list is a very good way to get daily inputs from people. The problem is that knowledge is not well structured. When you go to an existing mailing list that already has tens of thousands of threads of discussion in it, you get lost. You don’t see a knowledge structure or a kind of knowledge map that allows you to quickly grasp knowledge in this area. What you can do only is searching. But mailing list can add some more features to present a better overall knowledge structure, to be more like knowledge engine. If we take each thread of discussion in mailing list as a significant experience or note in knowledge engine, you can view those threads as many significant experiences or notes in the knowledge engine. Usually a lot of important points very useful for knowledge construction in this area are lost in the discussion. With a mailing list people can also extract important topic embedded in the discussion out as another thread for discussion. So encourage people to do so. (But since mailing list is more about mail instead of consciously building knowledge based on significant experiences, such practice might often get ignored by mailing list users.) In gmail, people can star the thread. If we count the total number of stars, we also get the vote for the thread. Gmail has tags as well. If the tagging feature is a little stronger, for example, a standard set of tags for choosing from (individuals can still add their own tags), and encourage people to use tags, the mailing list has the tagging feature as the knowledge engine. Then using mailing list for knowledge accumulation is about the same as the knowledge engine. We can get about the same knowledge representation, although less natural and straightforward. For example, the title and content in the mailing list are used more careless, and cannot be changed once sent out. But in knowledge engine, since it is for knowledge building based on significant experiences, those significant experiences or notes get continuous update or polishing based on people’s inputs. Knowledge engine can easily integrate the mailing list into itself as a way of interaction among members. For example, when member create a note, an email will be sent to other members. By replying the email, it automatically become comments of the note. You can also create a note by sending an email to the group. Compared to mailing list, on mailing list, people send emails mostly for asking questions. But on knowledge engine, it is for consciously building up knowledge. It can include questions as well, by adding the “question” tag. Compared to mailing list, it is easy to separate discussion into various topics (for example, by wiki page). Usually for a large mailing list with tens of thousands of mails, it is hard to identify several focus areas. Also when you want to extract knowledge out of those mails and put them together as some wiki pages, it is hard. But in the knowledge engine, it is very easy since notes are already sent to certain wiki pages and are attached to those wiki pages. So at the very least, you can pretty much use knowledge engine as how you use mailing list. With a little more effort, it provides a much better result of knowledge representation than traditional mailing list. For example, it is much easier to extract knowledge out of discussion to form a wiki page. It further provides more possibilities. For example, create a new wiki page and move notes around. This is impossible in the traditional mailing list. You can filter out those notes attached to the wiki page by limiting the voting to be above a certain number (-1, for example). You can also send one note to several wiki pages. So although people might ask questions on knowledge building (for example, how beginners should learn python) in mailing list, knowledge engine is more complete for knowledge building, and it provides means to shape into a better structure, at the same time it still keeps it simple to enter info and provide inputs. What’s more, sharing of those individual notes or higher level structure of knowledge are strongly encouraged and means are provided to share to or get embedded in various sites. So these significant experiences or higher construct really become reusable knowledge. Compared with online forums, yes, online forum can summarize knowledge in a bulletin board by highlighting some posts and put them at the very top. And the the online forum can also add tagging, vote, allowing people to create a post very easily from everywhere and get sent to certain board, capability to build higher level knowledge construct based on those threads, and all the sharing and embedding things, if you do all these, then it is quite like knowledge engine. Compared with twitter or weibo, twitter or weibo is just talking to people online. It is just streaming, no structure at all. Snippets we use, are like tweets, but a little more structured, without requiring too much additional efforts for people to enter. People just contribute their wisdom or effort little by little, whenever they want. In short, the knowledge engine is just a more complete picture that is not limited by any particular tool, be that mailing list, wiki, blog or twitter. We want it loud and clear that knowledge be based on significant experiences. 🙂 In software programming, it is very important to find the right data structure for the domain. We believe knowledge engine is a better representation of knowledge and thus it will empower all knowledge-related work.